ELEVAGE: Hand picked grapes were crushed and destemmed and put into a bin for a two day maceration before being bucketed into the half-ton bladder press. Settled juice was pumped into a stainless steel tank to ferment. In September of 2016 the still fermenting wine was racked off its lees and gravity bottled by hand without fining or filtration. Fermentation continued in the bottle to produce a naturally sparkling wine. No dosage and non-disgorged. Bottled under crown cap. TASTING NOTE: 2015 Eminence Road - Riesling - Seneca Lake Vineyard - The nose is lime, nectarine, slate and yeast with more of the same on the tongue. Gentle, persistent bubbles keep the things fresh and balance the honied stone fruits. The wine finishes dry with cleansing acids, more stones and a little grip. Fine to drink on its own or with some bratwurst. 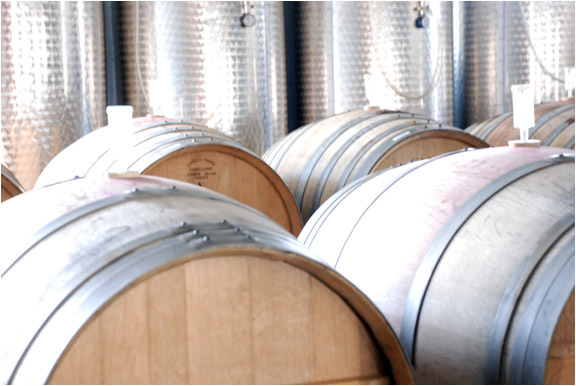 SENECA LAKE VINEYARD: In and around Lodi, New York on the eastern shore of Seneca Lake, grower Mark Wagner maintains nearly seventy acres of vines contained in six separate plots with soils mostly composed of deeper loam over shale and limestone. Green mulching and cover crops are used to manage weeds and vines are meticulously cared for with an eye towards sustainability. These vineyards produce classic Finger Lakes wines with wonderful balance and clarity. Barrels and tanks at Eminence Road Farm Winery.